If you’d like to buy a couple of our games and egt it a but cheaper, you came to the right page! For each of our bigger games, we decided to add Codinca at a bargain price. Why? Because we’ve been told its a great wee game. It’s selling in Barnes & Noble stores across the US, it comes in a robust pocket-size box with magnetic opening flap. It’s an ideal warm-up or filler game, its easy to learn and great strategy to play. When playing a two-players game, it’s very strategic. With three players, you have to watch both of your opponents. However with four players it is critical to make sure to take any opportunities when they arise, if not, you will probably not win that particular game. 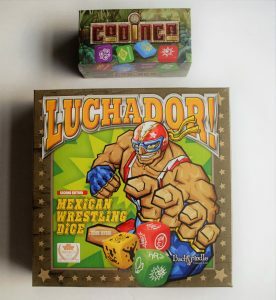 The HIT wrestling game Luchador! with Codinca for just £29.99. 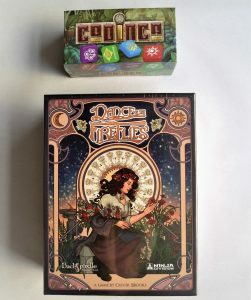 Our three Discworld games in one, Clacks with Codinca is just £34.99 and our brand new beautiful 2-6 player strategy game, Dance of the Fireflies together with Codinca is just £28.99.